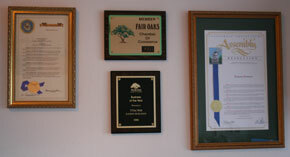 YNot Web was recently honored with the 2006 Business of the Year award by the Fair Oaks Chamber of Commerce. On hand for the award presentation at the Chamber general luncheon meeting was Assemblyman Roger Niello and representatives from Supervisor Roberta MacGlashan’s office who presented Kammy Burleson with a Resolution from the California Legistlature and a Proclamation of Recognition from the County of Sacramento. 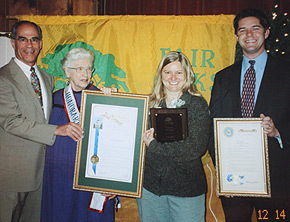 Noted in YNot Web’s community and business contributions were owner Kammy Burleson’s leadership of the Fair Oaks Business Development Group, creation and sponsorship of Fair Oaks Events Community Calendar and chairing and growing the Fair Oaks Dog Walk for the past two years as well as three years service on the Chamber’s Board of Directors.